Cate: Please welcome Loreen Augeri. Loreen, will you please share a short bio with us? Loreen: First, I would like to thank you for having me here today. I live in Massachusetts with my husband of twenty-nine years and two daughters. I am a member of RWA and the New England Chapter. When I am not writing or working in the town library, I enjoy reading, walking, and spending time at the beach. Cate: Tell us about Tormented Hearts and where it's available. Loreen: Tormented Hearts is a Regency-set historical romance about an earl devastated by his wife’s death and the part he played in it and a commoner fleeing from her abusive, aristocratic husband. Both want to be left alone to deal with life as best they can, but circumstances and the earl’s scheming brother constantly throw them together. While battling a fierce thunderstorm, befriending a wild dog, escaping into the forest, and fighting against the passion that consumes them, they heal each other’s tormented heart. It is available in paperback and e-book from The Wild Rose Press www.thewildrosepress.com, Amazon, Barnes and Noble online, Fictionwise, and All Romance. There are links on my website: www.loreenaugeri.com. Loreen: I will tantalize with a blurb and excerpt. Cate: Great conflict. What inspired you to write about the theme? Loreen: I love reading and writing historical romances, the Regency period in particular. Loreen: I work out the internal and external goal, motivation, and conflict for each character and then I go where the characters take me. Loreen: When I write, the characters live in my head and I try to take on their persona and feel their emotions. They only haunt my dreams when I am stuck on some point in the story and have to find a solution. The answers often come to me while I’m awake in bed when I should be sleeping. Loreen: I have a story I have almost finished editing, another that I am in the middle of editing, and an idea for a story that I will start as soon as I have completed the other two. Loreen: No, this is the first. I hope to have more in the future. Loreen: The most challenging aspect is finding the time to write. I need longer days. The most rewarding is the writing, creating lives for the characters, and of course completing a manuscript. Loreen: I have received wonderful reviews from reviewers and comments from readers. I couldn’t pick just one. It is always interesting to hear that people have read my book and loved it. Loreen: I love Johanna Lindsey’s and Catherine Coulter’s earlier historicals, Brenda Joyce, Sabrina Jeffries, Candace Camp, Lynsay Sands, Shannon Drake, Teresa Medeiros, and Joanna Bourne to name a few. Right now I am reading Tempted By A Warrior by Amanda Scott. Some of my favorite books are The Surrender by Pamela Clare, My Dangerous Duke by Gaelen Foley, A Lady Never Tells by Candace Camp, The Conqueror by Brenda Joyce, and The Birth of Venus by Sarah Dunant. Loreen: My website is www.loreenaugeri.com. I am on Facebook and Goodreads. Loreen: What is your favorite genre, and if you read historical romances what time period do you like to read about? Cate: Great question. 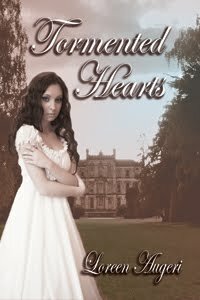 Readers, Loreen is giving away a PDF of Tormented Hearts to a random commenter... so start commenting. Loreen will draw the winner’s name notify the winner and post the winner’s name here. Thanks so much for being my guest, Loreen! Best of luck to you. Hi Loreen and Cate! I read everything, no preferred genre or subgenre. Historical, contemporary, paranormal, even horror and comedy. Tormented Hearts sounds like the perfect book to curl up with on a rainy day (it's raining here). Thanks for telling us about it and about you. Hi Loreen! Hi Cate! I loved Tormented Hearts, especially the hero. (I'm a sucker for tortured heroes!). I also love all historical romances, especially regency. This is a great debut novel, Loreen. Congrats to you! Hi, Cate. Love the premise of your story and your excerpt sizzles. Great debut novel. Wishing you many, many sales. Cate you are amazing. I can't wait to read it. Good luck to you and I hope you sell a ton of books!! Sounds like a winner! Sorry for the late welcome Loreen! Sounds like Tormented Hearts has roused some reader interest! Congrats. Thanks for reading the interview and commenting. It's raining here too, but it's suppose to clear up later. Thanks for reading Tormented Hearts and I'm glad you liked it. I love historical romances too, all time periods. Thank you, and if you buy it, I hope you like it. 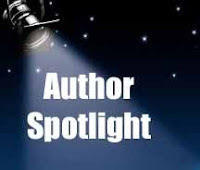 Thank you for having me on your blog today to talk about myself and Tormented Hearts. Hi Loreen! Hi Cate! Just stopping by to say 'hi.' I'm so pleased by your debut, Loreen, and I'm reading it now (love those Tormented Hearts!). Congrats on your book and many sales. I read the excerpt and I'm putting it on my TBB. Great interview Loreen and Tormented Heart sounds like a wonderful debut novel. I just love dark tortured heroes. I'm a huge historical fan, especially if the book teaches me something new about the time period. Here's wishing you great success. Congratulations and many sales to you. I read just about anything, even the backs of spray cans when I'm really desperate. Book sounds really good. Great interview, Loreen! A wounded hero always tugs my heart. Thanks for buying my book. I love tortured heroes too. I love historicals too. It seems I am always learning something new.If I am intrigued by something in the book I am reading, I will research it further. Thank you. I will read anything, but historicals are still my favorite. Keena Kincaid is the winner of a PDF of Tormented Hearts. Send your email address to loreen@loreenaugeri.com and I will e-mail it to you. Thanks for stopping by and commenting.